It’s rare for me to read a historical fiction novel that’s set in America, and when I do it’s usually an east coast setting so this whole Chicago setting sounded intriguing and I thought I would try it out! Born to society and a life of privilege, Bertha Honoré married Potter Palmer, a wealthy entrepreneur who called her Cissy. Neither dreamed the direction the other’s life would take. He built the Palmer House Hotel, still famed today, and became one of the major robber barons of the city, giving generously to causes of which he approved. She put philanthropy into words, going into shanty neighborhoods, inviting factory girls to her home, working at Jane Addams’ settlement Hull House, supporting women’s causes. It was a time of tremendous change and conflict in Chicago as the city struggled to put its swamp-water beginnings behind it and become a leading urban center. A time of the Great Fire of 1871, the Haymarket Riots, and the triumph of the Columbian Exposition. Potter and Cissy handled these events in diverse ways. My initial thoughts on this book were, it was full of history……a lot of history. Now I like history just as much as the next person (I do have my Masters in American history so clearly I love it) but when I am reading books ‘for fun’ and ‘entertainment’ I don’t want that much focus to be on the historical aspects. On one hand it was nice to have such a complete background of the goings on at that time and in that location, but for me it was dense and a little much. 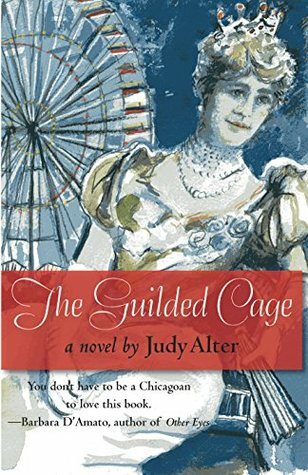 I did walk away feeling like I had a better understanding of the of the social climate of Chicago and I thought Alter did a great job at constructing a character that fit within the social/historical setting that Alter created. Cissy was a very strong heroine for the novel and I thought she worked well within the time period. I wish I had connected with her a little more, I am not sure why but I just didn’t feel as connected to her as I would have liked, but overall I was satisfied with her as the main character and I thought her personality traits were suited for the era so well done with the character sketches. As a last critique, the cover. I didn’t feel like this cover really did much for me. It was kind of bland and I think could have been designed better. The Ferris wheel has potential but the woman on the front didn’t really draw me to the book. I just think it could have been better. Over all this is an ok read. I liked it, but I wasn’t in love with it. It as a little too heavy handed on the history for me and while I did like the historical elements I began to lose interest because of the dense historical build up at times. However I have heard rave reviews about the Columbian Exposition piece…..not really my area of interest but for those who are into immigration and how it effected social ranks etc this is a great read! I would recommend this book to people who really really love history and are interested in immigration issues in early turn of the century America than this is would be a good option!